There is something about chalkboards that appeals to children. Perhaps it is the idea of writing on a wall (which children are often told they aren't allowed to do,) or maybe it is because of the opportunity for creative expression. Whatever the reason, chalkboards and kids go hand-in-hand. Thanks to this paint, there is no need to go through the hassle of trying to hang an actual chalkboard on a wall, which can be difficult to level and leave damaging holes in the wall. However, while the wall is an obvious place to use this type of paint, it can also be used on other surfaces for an unexpected and fun surprise for kids -- on furniture. Have a piece of furniture that is ideal for turning into a chalkboard? Before you grab a can of paint and start painting, read these tips to help you create a great piece of chalkboard furniture. How to Find Chalk Paint. Traditional Paint. This type of chalk paint can be used on virtually any surface. It is the standard black color, and it is applied with a brush. Spray Paint. If you are looking to create a super smooth finish, go with spray chalk paint. It glides onto the surface and doesn't require a brush. The downside is that it can drip. Colored Paint. If you're looking to create a different look, opt for colored chalk paint. Color choices include green, pink, white, and blue, among others. Magnetic Paint. Not only will kids be able to write on the furniture that you use magnetic chalk paint on, but they will also be able to hang their latest creations from it by using magnets. To choose the best chalk paint for you, consider what you are trying to achieve -- do you want the furniture to tie into a color scheme, or do you want kids to be able to use magnetic letters on it, for example -- and choose the paint that will allow you to meet your needs. How to Apply Chalk Paint. 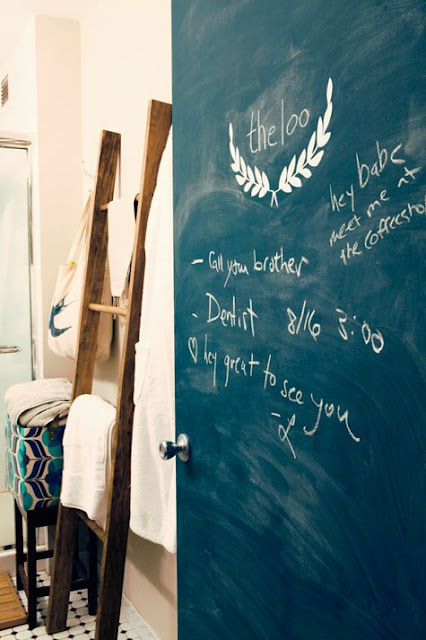 The application of chalk paint is relatively simple. 1.Start with a clean, smooth surface. If the piece of furniture is rigid, smooth it down with sandpaper. Use soap and water to remove dirt and debris and dry the furniture. Avoid household cleaners, as they may contain lubricants that will make it difficult for the paint to adhere to the surface. 2.Apply a coat of primer to the furniture. Basic paint primer is fine. Use a paintbrush to apply it to the surface, using smooth, even strokes. Allow the primer to completely dry. 3.Apply the chalk paint. Whether you are applying it with a brush or using spray paint, use smooth, even strokes. Work with the grain of the furniture to achieve the smoothest finish. Allow the first coat to dry and apply a second coat in the same manner. 4.Allow the paint to completely dry. In approximately 48 hours, the paint should be dry and ready to write on. Do note that painting in a cool, dry area is optimal, as this will allow the paint to dry quicker. Imagine how much fun your child will have expressing his creativity on chalk painted furniture! It is sure to provide hours of entertainment. Bridget Galbreath is a freelance writer who writes on a variety of topics, including crafting, decorating, and even the business magnate Stephen Wynn. Chalkboard Paint Home Helpers - Martha Stewart Crafts. beautiful red dresser was found at Isabella & Max Rooms. Chalkboard Paint Martha Stewart Crafts.